The First Courtyard is the main entrance to Prague Castle and forms the impressive western side of Castle Square (Hradčanské náměstí). As a result, it is always a very busy space, as crowds of visitors pass through the gateway – or have themselves photographed with the sentries, who stand guard on either side of the gate. The courtyard dates from the third quarter of the eighteenth century and thus 1is the most recent of the three courtyards at Prague Castle. The impressive statues of fighting Titans above the gateway are copies of the originals, created by artist Ignaz Platzer the Elder in 1768. The buildings around the First Courtyard date from the 1760s and, like many of the more recent buildings in the Castle complex, were designed by the Viennese architect Nicolo Pacassi. The statues and sculptures on the parapets are original and were designed by Ignaz Platzer the Elder. 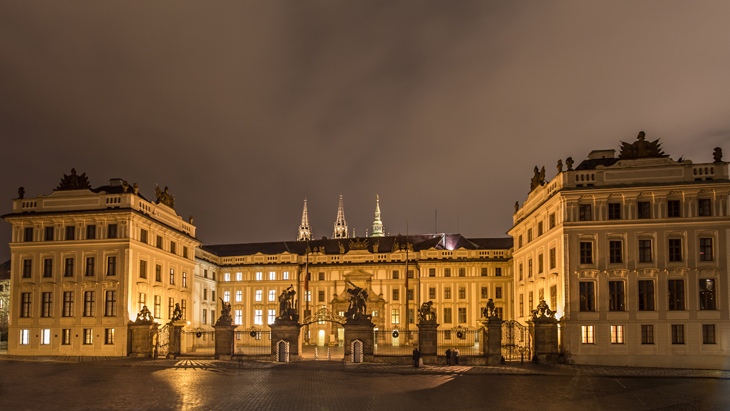 The huge pine flagpoles are a more recent addition; they were added by Slovene architect Josip Plečnik, who was appointed by Czechoslovakia’s first president, Tomáš Garrigue Masaryk, to carry out alterations Prague Castle in the 1920s. Every hour, a low-key changing of the guard ceremony is held in the First Courtyard, and at midday a grander ceremony takes place, including a fanfare.